When the pain or smell gets unbearable we fine citizens of Southeast Michigan head over to Doctor Hershenberg’s office for a full teeth rotation. Dr. Hershenberg (or, more likely, one of his silent Czech assistants) pulls out each of your adult teeth, cleans them in an elixir of his own design, and replaces them in opposite locations throughout the mouth. The good doctor owns the patent on the procedure and has built an empire around it. The rotation helps keep your bite even and your balance aligned and it’s usually covered by even the weakest insurance plans as “preventative” treatment. 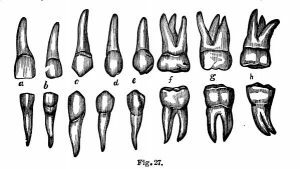 Allegations that the doctor invented an otherwise absurd practice simply so he could build up a collection of photos of naked, toothless gums have been regularly denied. Still, other dentists claim flossing and brushing are enough on their own. And the process is not painless both to one’s mouth and schedule. The three hour appointment does impact one’s soap opera viewings. And it’s hard to ignore claims that they’ve woken up with someone else’s teeth or even those of a badger as their smile. Ultimately the Doctor is OK in my book. Really, who’s to say a dentist must have a first name. Or shouldn’t wear a Lone Ranger mask?